The Active Asset Allocator remains defensively positioned with euros, bonds and precious metals accounting for 80% of the asset mix. The strategy has returned +2% YTD in a very challenging environment where global equities have fallen -14% and the average multi-asset fund has declined -9%. With stocks now in a confirmed bear market, volatility is creeping higher while margin debt has peaked and is rolling over. There is room for equities to rally in the short-term but I expect bear market forces to take hold later this year. Bonds continue to defy the top callers and with JP Morgan recently forecasting that ECB rates on bank deposits could be cut from minus 0.3% to minus 4.5%, there is certainly more room for bond yields to fall and prices to rise. Finally, I touch on some exciting developments in the gold market, which may, finally, be waking up from a four year slumber. If that proves to be the case, there are exciting times ahead for precious metals investors. The Active Asset Allocator remains defensively positioned with euros, bonds and precious metals accounting for 80% of the asset mix. The strategy has returned +2.2% YTD in a very challenging environment where global equities have fallen -14% and the average multi-asset fund has declined -9% in the first six weeks of the year. From a technical standpoint, global stock markets are in a confirmed bear market with many trading 20%+ below their recent highs. The majority of volume traded on the New York Stock Exchange each day is flowing into declining shares. Evident in the following chart, when the majority of volume is flowing into declining relative to advancing stocks, the S&P follows the trend lower, and sometimes in a meaningful way. The trend can turn at any stage and I continue to watch for signs of a reversal. However, for now, I remain defensively positioned. 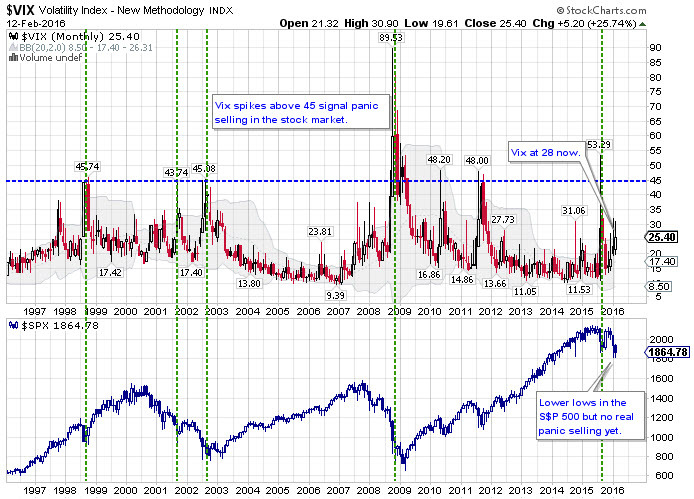 When stock markets decline, volatility tends to spike higher and the Vix Index captures this trend. At prior meaningful lows in the stock market, the Vix Index has spiked to a level of 45 or above, as investors rush for the exits together, creating the oversold conditions necessary to lay the foundations for the next market advance. The next chart shows that, while volatility has increased in the first six weeks of the year, we have yet to experience any real sense of panic selling in the stock market. The Vix Index closed out last week at 25. Despite the double digit stock market declines YTD, investors remain in confident mood. That may be about to change however. Margin debt represents borrowed money, or leverage, used by investors to speculate in the stock market. One glance at the next chart shows the risk seeking nature of investors in recent years as margin debt as a percent of nominal GDP has surged back to the prior bubble peaks of 2000 and 2007. Margin debt has a tendency to peak with the stock market and that now looks to be the case. Importantly, this chart does not yet reflect the high volume selling that has taken place in recent weeks. The next update later this month will show a sharper decline in margin debt. If this trend continues, we will certainly get a spike in the VIX towards 45 as investors scramble to close out highly geared positions in a declining market. In the meantime, I continue to wait patiently for a low risk place to turn more constructive on equities. Despite the 2% rally in global stock markets on Friday and some follow through buying on Monday this week, the path of least resistance remains down for the FTSE All World Index, the global stock market benchmark. There is a glimmer of hope for the bulls and I am watching closely to see if a meaningful reversal can take hold. At each prior major low in the stock market, the S&P 500 experienced heavy selling, rallied and then went on to make a lower low shortly thereafter, but the Relative Strength Index (RSI) failed to confirm this lower low in the price index. The higher low in the RSI signaled that selling pressure was easing despite the stock market decline, thereby laying the foundation for a market reversal. We have a similar condition unfolding today in the S&P 500 (red dotted support lines on RHS of the next chart). However, this set up is only evident in the S&P 500 Index. The other major US and European indices have no such divergence in place, leading me to believe that the S&P 500 will follow the many other indices breaking down shortly. Also, the S&P's long-term 50 week moving average (WMA) is about to cross bearishly below the 100 WMA for the first time since 2008 (point (IV) on the chart below), as this bear market takes hold, with serious potential consequences for stock market investors. As noted above, there is no divergence in place between price and relative strength for the Russell 2000 Small Cap Index or the Euro Stoxx 600 Index of European shares or many other charts that I have reviewed but not included here. 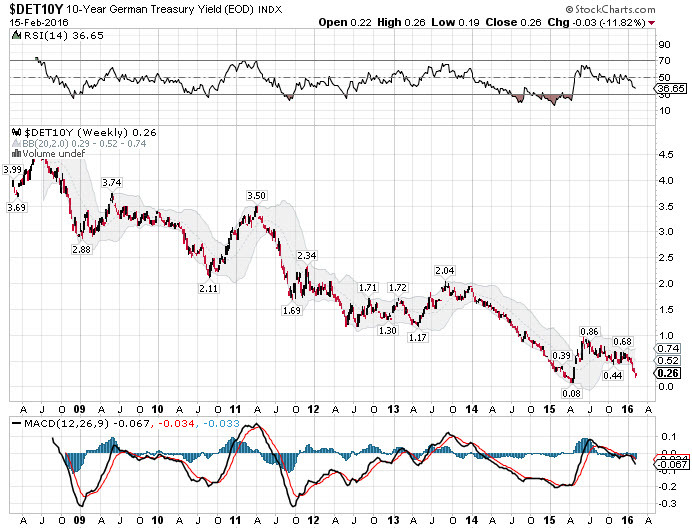 Mario Draghi of the ECB said recently there would be “no limit” to how low Euroland yields could be pushed. Janet Yellen at the Fed has already stepped back from her plan to increase interest rates after a mere 25 basis point tightening (the likelihood of a March 2016 rate increase has fallen from over 60% to around 10%). Meanwhile Haruhiko Kuroda of the Bank of Japan is trying hard to lead his country down a path of negative interest rates and destroy the JPY in the process. JP Morgan also recently reported that the ECB could cut the rate it charges on bank deposits to minus 4.5% compared to minus 0.3% today. These policies do not work yet Draghi, Yellen and Kuroda continue to print, pushing on a string and hoping that their combined efforts will stimulate demand. 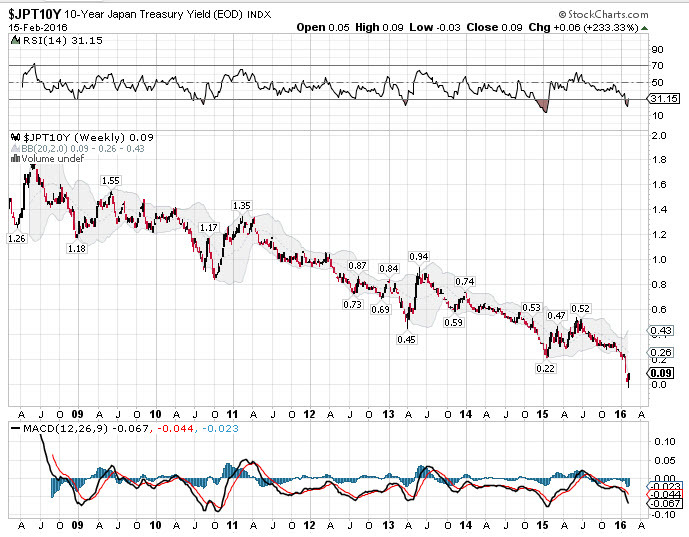 This backdrop continues to be favourable for bonds. We are certainly in uncharted territory, yet if the ECB cuts the rate it charges on bank deposits from -0.3% to -4.5%, EU government bonds yields can certainly continue to fall.... and that is exactly what is happening. The bull market in bonds rumbles on. The Active Asset Allocator continues to maintain a 30% allocation to EU fixed interest, corporate and inflation linked bonds. The gold bull is waking up. Gold is on track to close above its long-term 20 month moving average this month for the first time since topping out at $1,923 in 2011. A close above $1,175 should do it. The gold mining stocks have reacted strongly to the recent surge in the price of gold, confirming this move could be the real deal. I need to see more bullish confirmation in price unfold before being confident that the bear market is in fact behind us but so far, this move looks good. Many of the gold mining stocks have rallied 40-60% in recent weeks, but they have been so unmercifully and so aggressively sold over the past four years that the YTD rally is hardly noticeable on a long-term chart. If the gold bear market is over and the bull market is about to resume, the miners will shoot the lights out over the next few years. 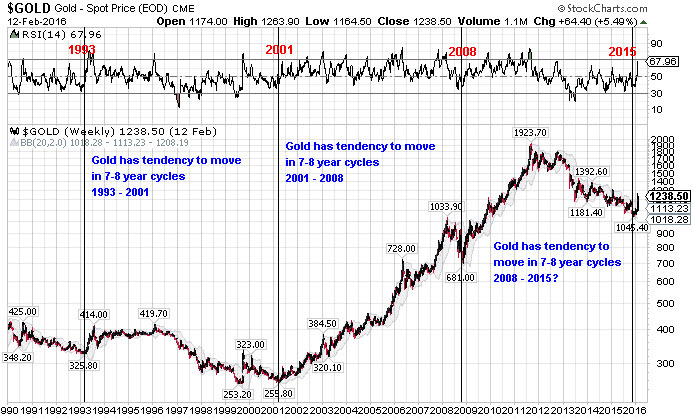 I have noted before that gold tends to move in 7-8 year cycles and right on cue, gold is waking up and a new eight year cycle is about to begin. Following the sharp declines of 2012 and 2013, gold has spent the past two years consolidating in a more bullish fashion. Now we are seeing bullion break out higher in all currencies as the next leg of this bull market kicks off. For those patient enough to handle the swings and stay invested, it will be a sight to behold. If you know of any colleagues or friends who may have an interest in my investment approach, please do share my contact details. All new business leads are very much welcomed! Thanks for stopping by and sincere thanks again to all of you who have already signed up as a Secure Investments client or who are still thinking about it!